In part 1 of this post, I talked about how the Museum assessed the potential impact of construction-related vibration on our exhibition spaces. A second ongoing project specifically related to development of the Canadian History Hall is a dust-monitoring program. While most people consider dust an eyesore, conservators know that it is a contributing factors in the deterioration of artifacts. Consequently, ensuring that dust levels remain at or below an acceptable limit is essential to ensuring that artifacts do not have to undergo additional, potentially labour-intensive cleaning. 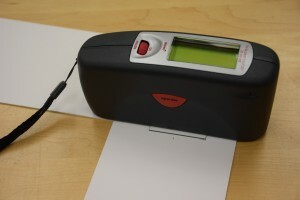 Using a gloss meter — the Tri-Glossmaster — we can measure the “loss of gloss” caused by dust falling onto a glass microscope slide. This image shows the typical measurement setup with the Tri-Glossmaster sitting on top of the glass microscope slide. The glass slide is placed on a standard backing, which is used to ensure consistent readings from week to week, and location to location. The difference between the measurements of a clean and a dusty slide are plotted on a graph, which allows us to see spikes in dustiness. These spikes can then be attributed to factors such as construction in the area. The baseline set of measurements seen in the graph below were taken over several months, prior to the start of demolition, to help identify those spikes in dust levels. 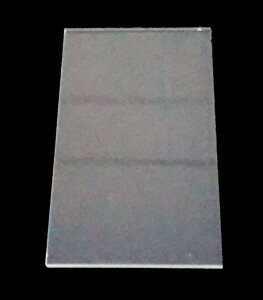 A clean glass microscope slide. 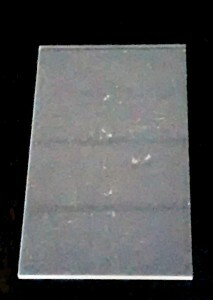 A dusty glass microscope slide. Implementing clean worksite practices is key to reducing the potential impact of dust on the artifacts, and to keeping conservators satisfied that the best care possible is being provided for artifact preservation. This graph shows a baseline set of measurements taken over a period of 24 weeks. 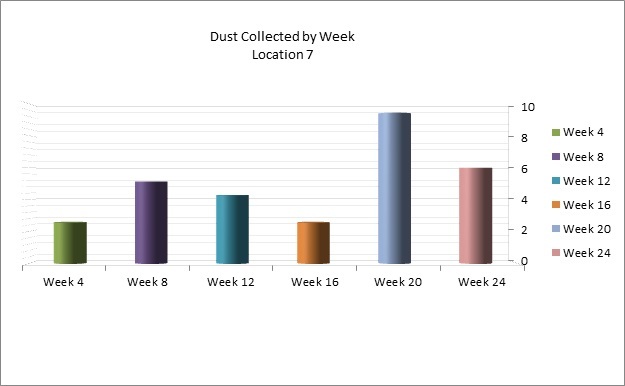 Week 20 shows a significant increase in the measured dust level. This can be attributed to the construction of a number of walls that were designed to close off an access point for the duration of the Canadian History Hall construction project.